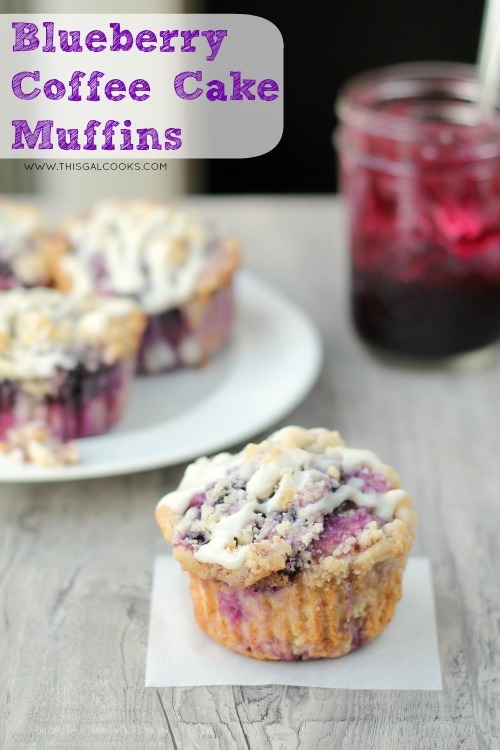 Topped with homemade blueberry preserves, streusel and cream cheese glaze, these blueberry coffee cake muffins are sure to put a smile on everyone’s face! So how’s the weather been treatin’ ya? It’s been pretty crummy in my neck of the woods. Yesterday was the first day that it hadn’t rained in about two weeks. Not that I mind the rain. I actually enjoy stormy weather. But it’s definitely put a damper on my outdoor walks/jogs. Not to mention the unbearable humidity. Oh did I say it was humid outside? Believe me, it’s humid outside. But I try to look at the positive things, and I just look at all of the rain as something that makes my plants happy (and usually me happy since like I said, I enjoy stormy weather) and I just have to push my walks into the late evening instead of right after work. It all works out in the end, right? Anywho, since it’s still morning time in my neck of the woods, I have a delicious breakfast to serve up. And for all of you folks that are ahead of my time, here’s an afternoon snack or an after dinner treat for you. 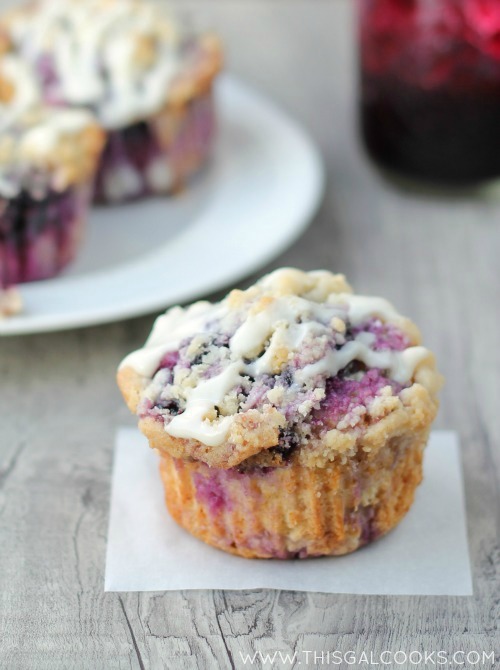 Who said muffins were only to be served at breakfast, especially these Blueberry Coffee Cake Muffins! Enjoy! 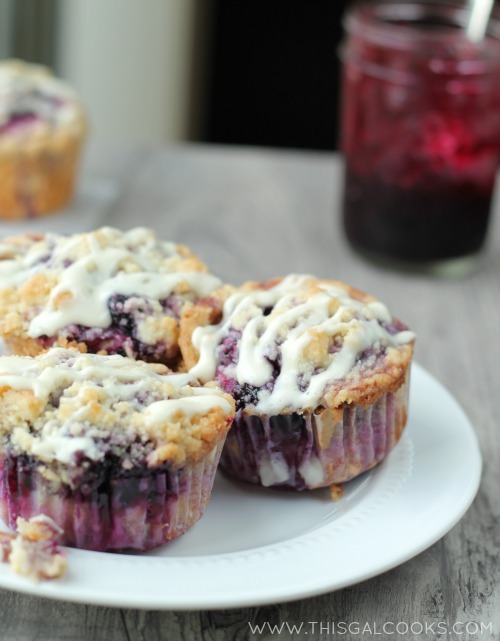 Topped with homemade blueberry preserves, streusel and cream cheese glaze, these blueberry coffee cake muffins are sure to put a smile on everyone's face! In the bowl of a stand up mixer, using the flat attachment, beat together ½ of the cake mix, the water, flour and yeast. Beat in the eggs until well blended. Drop the batter by spoonfuls into lined muffin cups. I probably used about 2 tbsp batter per cup. Drop a spoonful of preserves on top of the dough in each muffin cup. In another mixing bowl, combine the butter and remaining cake mix. Cut the butter into the mix until the mix is crumbly. Top the blueberry mixture in each muffin cup with the crumbs. Bake at 350 for 20 minutes or until the topping is golden brown. Remove from the oven and cool a few minute before topping with the glaze. To make the glaze, in a mixing bowl, beat together the cream cheese and powdered sugar. Beat in the vanilla extract, then the whipping cream and then gradually beat in the milk until the desired consistency is reached. Mine was thick but runny enough that it could be drizzled on top of the muffins. To drizzle, I cut a small corner off of a 1 qt storage bag, added the glaze to the bag and squeezed the glaze on top of the muffins. If you have a fancier contraption, feel free to use that. I often link up to these fabulous parties! These look amazing with the cream cheese added!! Yumo! I love blueberries. This looks delicious! Thank you, Nami! I actually enjoy raw blueberries in salads. There’s a salad at Panera Bread that I enjoy. It has chicken, blueberries, cherries, mandarin oranges and pecans in it. Yum! I seriously need these muffins…they look so good!!! These muffins look FABULOUS! 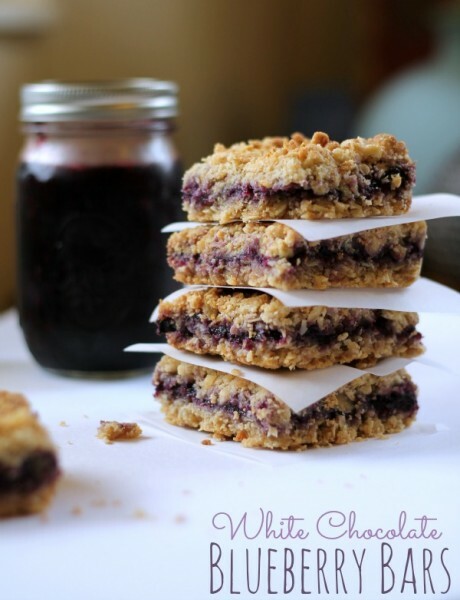 I love blueberries and anything with crumb/streusel topping, gets a thumbs-up in my book! Lovely post Julie. Julie, I love these… they look so purdy too! Pinning and making and eating them soon!! Love this recipe! Im a big Muffin fan! 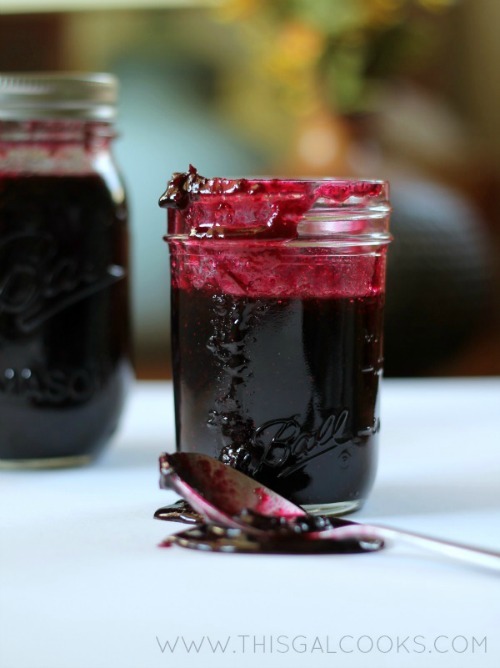 Another great way to use your beautiful blueberry jam! I like that these muffins come together with preserves and don’t depend on fresh berries. I have company coming soon and will plan to have this recipe to try with them. Pinning for later! These sound delicious and they look like they came from a bakery or a coffee shop! Sounds like a great muffin recipe! I love blueberry muffins! And surely you can’t go wrong combining them with coffee cake! I’m always on the hunt for a good muffin recipe to start out my weekend. I’m pinning these to my muffin board and can’t wait to give them a try. I hope your weather turns around!! I feel ya on that! We often do not eat all of whatever I make. It’s nice to make treats that can be easily shared with others! :) Hope you enjoyed your vacation, Meghan! Look at all that gorgeous blueberry preserves in each little muffin! Oh how I wish they were in front of me this boring! The perfect breakfast!!! It gets humid here too then my hair frizzes and it’s just a big ole mess! Don’t you hate the humidity!? It has been a little better the past couple of days. I can walk outside without being drenched in moisture. :) Thanks for stopping by. I need to make a big batch of these and bring them to an in person NNIB Gals meeting. Wouldn’t that be AWESOME?! Humidity is the bane of my existence in the summer. I’m already ready to give up on my hair and it’s only June! I’ll never make it through the summer. Anyway…these muffins look great and now I’m off to check out your blueberry preserves recipe. Thank you, Elizabeth! I’m becomming a bit of a muffinholic. I’m already planning my next muffin recipe! Those blueberry preserves just keep on giving! These look so good! I love muffins and would definitely like to try these, Julie. These muffins look so delicious! I’m gonna have to try this for sure. Thank you for sharing! Thank you so much, Dana! Heading over to link up now! Have a great weekend! I’m just going to say it, I’ve been craving these since you first posted them! Thanks for linking up Saturday Dishes, pinned. Oh my gosh these look to die for!!! I love blueberries, so I am checking out your white chocolate blueberry bars too. You have a new follower via blog lovin! Yum! My kids will love having these for breakfast. Thanks for sharing at Inspire Us Thursday at Organized 31. Delicious, Julie! I need to pin these to try! Thanks so much for sharing at All my Bloggy Friends – I can’t wait to see what you share this week! These muffins look delicious Julie! So pretty! Pinned! These look so delicious! I wish I had some blueberries on hand to whip them up. I’m going to check out the Blueberry Preserves now too! These were better than the bakery! Aww well thank you so SO much for letting me know, Deb! Have a wonderful weekend! Congrats, your recipe is being featured in a Blueberry Round up. I will also be pinning and tweeting it this week too. Awesome! Thank you so much, Diane! How long do you recommend baking them for, if making them mini-sized? I’m making them this weekend for a large crowd so I want to make mini’s so they can go further! Pingback: 18 Blueberry Recipes to Go Bonkers Over! I tried this with my son. He loved them. I am not a chef at all so these did not come out the same way yours did! Thank you so much for stopping by and letting me know you made them! I’m glad your son liked them! I’m not a chef either – it just takes practice. :) Have a wonderful week! Definitely perfect to pair with coffee! Thanks for stopping by! I have never put active dry yeast in muffins like this before…what inspired you to try it?